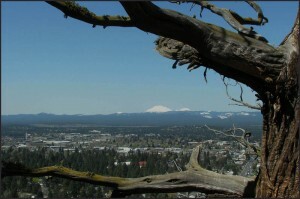 Recently the host at Pilot Butte State Park in the city of Bend confronted a woman who had been cutting across the trails with two dogs off leash–both definite no-no’s. Her reaction was “Why should I care? It’s just a pile of dirt in the middle of town!” Well maybe, but what a pile of dirt! And how many cities have an easily accessible butte that offers a good 2 mile loop road/trail work-out with a serious elevation gain? And I might add, some serious views. I can also recommend the people watching. 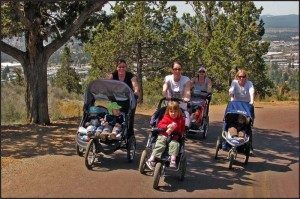 I called this group the Mommy Armada! There are many old junipers along the trail with interesting root structure and gnarled branches. There are also lots of our desert shrubs and native grasses. The good news is that there are wildflowers on the Butte as well. 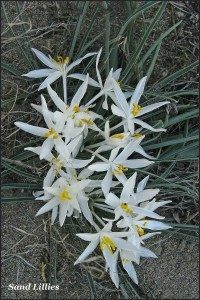 The first ones to appear in the spring are the sand lilies and they appear right along the trail. Soon other species begin to bloom. About mid-June, things really begin to pop! Expect to see masses of yellow Oregon sunshine and Buckwheat mixed with the purple Penstemons. However, if you come across this next flower which looks like a snapdragon, pull it out. 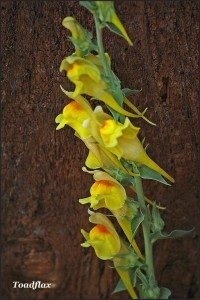 It is the invasive weed Toadflax.